Aaron Mccargo Jr. was born in 1971, in Camden, New Jersey, USA. He is an acclaimed chef, known for winning the television show, called “The Next Food Network Star”, and also for his own culinary show, “Big Daddy’s House”. This show is considered to be one of the most successful culinary shows. The “Big Daddy’s House” gained recognition because of his quite simple recipes that can be used by everyone. What is more, Aaron cooks for his family members and it creates a very cosy atmosphere. If you consider how rich Aaron Mccargo Jr. is, it can be said that Aaron’s estimated net worth is over $3 million. The main source of this sum of money is his own culinary show. Of course, winning “The Next Food Network Star” had a huge impact on the growth of Aaron’s net worth, although even before his success and acclaim as a chef, Aaron had various activities that also added to this sum of money. Aaron became interested in cooking when he was very young, as he played with an “Easy-Bake Oven”. When his parents noticed his interest they encouraged him and allowed him to cook together with them. When Mccargo was only 13 years old, he decided to become a volunteer at the Cooper University Hospital, and worked in the kitchen. In 1989 he finished Camden High School and decided to continue his cooking classes at the Academy of Culinary Arts. Unfortunately, he was not able to complete his studies, but during that period and afterwards Aaron worked in such restaurants as “Steak 38”, “T.G.I Friday’s”, “Marlton Tavern”, “Holmes Lounge” and others. It was the time when Mccargo’s net worth began growing. As Aaron gained more experience, he decided to open his own restaurant, called “Mccargo’s Creative Cuisine”. Sadly, this business was not very successful and he had to close it in 2005. Three years later he joined “The Next Food Network Star” show, which his skills and experience allowed him to win, and he had an opportunity to create his own culinary show, which had a huge impact on the growth of Mccargo’s net worth. This show aired for six seasons and gained a lot of fans. What is more, Aaron gained more recognition and received invitations to appear in various public events. Recently Mccargo has been working on his dream to again open his own restaurant, and from time to time he also appears on the television show “Bar Rescue”. If to talk about Aaron’s personal life, it can be said that he is married to Kimberley, and they have two sons and a daughter. He strongly believes in Christianity and has even joined The Living Hoper Christian Center. All in all, Mccargo has been working hard for his dreams and he has already fulfilled most of them. As he loves what he is doing there is no doubt that he will continue working in the food business, and will remain one of the most appreciated chefs. 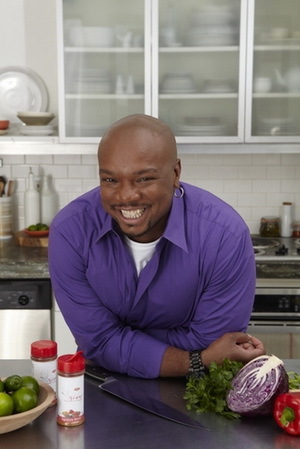 Full Name Aaron McCargo, Jr.
1 Winner, Food Network Star (2005), season 4. 2 Brother of Donovan McCargo. 3 Father of Justin McCargo.